For the first time in Sri Lanka, Gayan Perera, the well-known Australian National Fitness Model, is going to host a workshop on fitness issues and clear all doubts and myths about work out and nutrition plans. The event organised by Ramindu Randeni, an online influencer, will be held at Idea Hell, Colombo 3 on 27 January from 10:30 a.m. to 2 p.m.
Sri Lanka is in need of refined knowledge about fitness and nutrition. In a time that information is available at a touch of a button where many myths and commercially-manipulated unhealthy habits are going viral, it is crucial that we learn what is actually correct which is backed by firsthand experience and scientifically-researched facts. The event will unfold with myth busting, how to create a nutrition plan, a workout plan correctly and how to avoid injuries and break plateaus with the right knowledge. It is ideal for all fitness enthusiasts of all age who work out to stay fit, lose weight, gain muscles or pursue a sport. 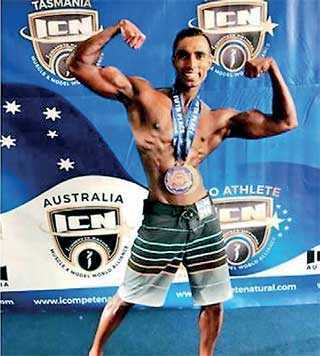 Gayan Perera, a Sri Lankan talent, has twice been the Australian National Fitness Model and Southern Universe Champion. Tickets are priced at Rs. 990 and available to purchase at 444.lk. For more details call 0779 952516 or reach out to Ramindu Randeni on Instagram – @ramindurandeni and Gayan Perera @gayan323.